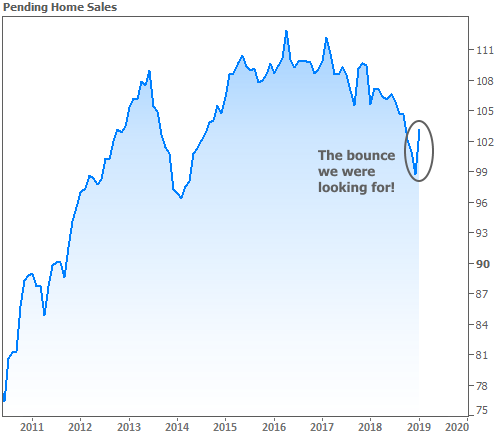 Two weeks ago, the newsletter discussed why 2019 could actually be great for the housing market, despite downbeat reports and the likelihood of one more month of weakness for Existing Home Sales. That weakness showed up last week, but with it came a comment from the chief economist for the National Association of Realtors saying home sales were likely at a cyclical low. As of Wednesday, we finally got the Pending Home Sales report showing the bounce we were looking for. Pending Sales momentum is a precursor for a bounce in the next Existing Home Sales report in a few weeks. That means there is indeed a chance we just saw a cyclical low. Unfortunately, we also saw the beginning of a fairly abrupt move higher in rates on Wednesday. Early that morning, underlying bond markets (which dictate mortgage rates) began to look panicked. It wasn't immediately clear what caused the move, although Brexit-related news was the leading candidate. Why does Brexit news matter to US interest rates? First off, US rates will always take some cues from major overseas markets. This is especially true of German and British sovereign debt. For instance, if British and German 10yr yields are spiking, US 10yr yields tend to experience some upward pressure as well (and US 10yr yields serve as key benchmark for mortgage rates). Rates, in general, tend to benefit from uncertainty and economic headwinds. Brexit represents a major unknown in terms of its impact on the European economy. The sooner it happens and the harsher the deal is for Britain, the greater that uncertainty. Wednesday's news suggested the deadline could be pushed back and a more favorable deal was still possible. While the Brexit updates have generally pushed rates higher, they alone do not explain Wednesday's market movement. Other explanations involved simultaneous congressional testimonies from Fed Chair Powell, Michael Cohen, and Robert Lighthizer (speaking about US/China trade relations--definitely a hot button for uncertainty). The catch is that none of these testimonies had started by the time the bond market began losing its composure. That leaves us with one of the most frustrating explanations from a market-watching standpoint, but also one of the most common: sometimes trading momentum is its own reason for existence. We do know that big trades started hitting the bond market right at 8:20am ET, which is an important opening bell for a certain group of bond traders. If this group comes into the market on any given day looking to make the same sorts of trades, rates can end up moving quickly without any apparent motivation from economic data or news. This "glut" of trading demand was definitely a factor behind rising rates Wednesday morning. It wouldn't necessarily be something worth discussing except that it started a chain reaction that lasted through the end of the week. Rates were well on their way to recovering when Thursday morning's GDP report came in stronger than expected. If anything, investors were on the lookout for the report to miss the mark due to the government shutdown. In general, if the 4th quarter of 2018 wasn't as bad as investors feared, that would suggest another move higher in rates. This is really when the chain reaction happened. Rates had been pushed high enough to definitively break outside the consolidation range seen in the red lines below. Such consolidation patterns often give way to breakouts that carry more momentum than average. It's not unfair to say that bonds can feel pent-up in such ranges and subsequently look to release that pent-up energy. Bottom line: rates frequently react to market fundamentals (economic data, news headlines, and other developments that speak to the economy). Sometimes, however, the fundamental explanations fall short and we're left to observe so-called "technical" motivations (patterns in the charts and other purely mathematical assessments of what rates should do based on past precedent). Bond traders were well aware of the consolidation range and the implication for a bigger move once it was broken. Without more panic surrounding Brexit, trade wars, and a GDP slump, it was only natural that the range breakout would take the unfriendly form seen above. 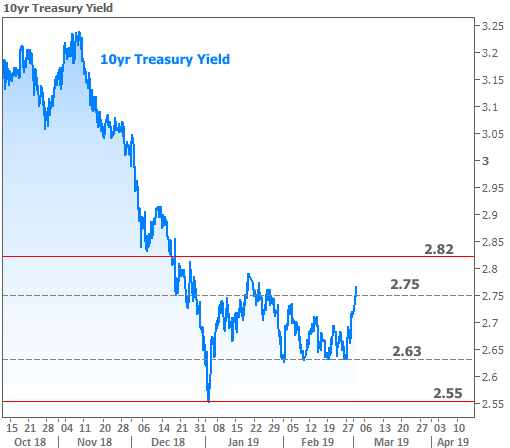 Is this the end of the road for our nice run of low rates in 2019? It's far too soon to conclude such things. Most traders are looking for the market to make bigger decisions in mid-March after the next Fed meeting. Between now and then, rather than plan on rates skyrocketing, a better baseline would be to shift the goalposts to something more horizontal, as seen in the following chart. 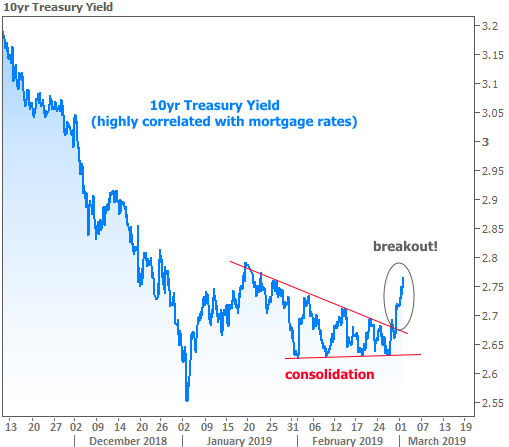 Charts in this newsletter tend to focus on 10yr Treasury yields because they are a benchmark for longer-term rates like mortgages. Movement in the Treasury market generally dictates the pace of mortgage rate movement. Plus, we can watch Treasuries move every second whereas mortgage lenders only change rates 1-2 times per day on average. Much like the chart of 10yr Treasury yields above, mortgage rates are also at their highest levels in more than a month. That said, several news articles were out yesterday claiming the lowest rates in more than a year. What's up with that?! 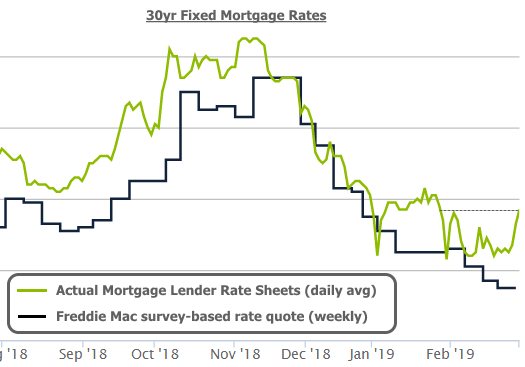 As is frequently the case when rates make big moves in the second half of any given week, the source of confusion is the methodology behind Freddie Mac's weekly rate survey. Big news outlets rely on the Freddie survey as source material. There's nothing wrong with that but it's important to note that Freddie's survey heavily favors Monday and Tuesday rate quotes while completely ignoring Thursday and Friday. If we look at actual lender rate sheet averages compared to Freddie's weekly number, we see a line that looks much more like Treasury yields above. The implication is that the Freddie rate survey should jump noticeably next week, barring some unforeseen salvation for rates.